Cemetery Commemorative Plaques & Flagholders - G.A.R. 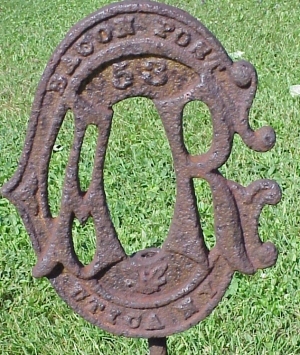 Thanks to our committed site guests, this has been identified as a commemorative flag holder of Bacon Post 53 of the G.A.R. in Utica NY. Haven't yet got an answer back from the GAR on that Bacon Post flag holder, so went in another direction to verify my hunch. The lower section of the below obit says it all. Respected Resident of Utica Died From Injuries In Oneida. Patrick Henry Foley of 34 Hager street, passed away Monday afternoon at Carpenters Hospital, Oneida, death being due to injuries received by falling from a well-drilling machine which he was operating near Wampsville Saturday. Mr. Foley was born in Canada July 8, 1842. After leaving school he learned the cooper's and carpenter's trades. He came to New York State when young man and settled at Ellisburg, Jefferson County. He also lived at Oneida and Clinton. For the last 30 years he has been a resident of Utica. Mr. Foley was very industrious and had many inventions to his credit. He was a veteran of the civil war and a prominent member of the Bacon Post G.A.R. holding most of the offices in that organization. All the time he lived in Utica, he worked in the well drilling business, at which he was an expert. Mr. Foley was married twice, his first wife being Mary Melita Nutting and his second Minerva Freeman. He leaves to morn his demise, John H. and Floyd of Utica; Millard of Oneida and Clarence and Joseph of Buffalo; three daughters, Mrs. Harry D. Sprague and Agnes and Anna Foley of this city, and six sisters, Mrs. Daniel Basset and Mrs. John Brewer of Adams: Mrs. William Culver and Mrs. Marie Hulburt of Greeley Col., and Mrs. Julia Atkinson and Mrs. S. Oberkirk of Paw Paw Ill. The Funeral was held from the home of his son, John H. Foley 34 Hager street, Thursday morning, Rev. John Smith, pastor of the Church of the Holy Communion, officiating. Members of the Post Bacon G.A.R., Louise Hart Tent No. 14 Daughters of Veterans and a squad from the Twenty-eight Separate Company attended in a body. The Oriental Quartet sang several selections. Internment was in the family plot in Forest Hills Cemetery. It's me again. I believe this may be Post Road 58. I went to the L.O.C. It suggested either Post Office or Post Road. I would like to believe the latter. I also started brousing the Bills issued by the House and Senate. Found a legislater named Ezekial BACORN who was associated with Utica,NY. I tried to print out what I found and got a black page. Can't understand the printing. It is there but in black. I told you I never give up. On with the search. Evelyn in Oh. During my research (trying to discover the person for whom the GAR flagholder was placed in the Soper Cemetery off Route 6 in North Towanda), I came across your interesting flagholder images. One struck me as quite interesting, so I did a little side research. I'm passing along the results of that search. The State University of New York at Morrisville has an interesting website dedicated to GAR information. You can read about the numerous GAR posts in Oneida County at this website. I do not intend to plagiarize, thus I have copied and pasted as a direct quote from the above referenced web page the section on the Bacon Post 53. Please read on. 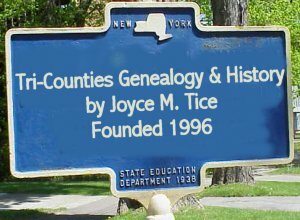 # 53 - Utica - Chartered Oct. 24, 1867. 1st Lt. William K. Bacon, Adjutant, Co. F, 26th NYSV. Joined April, 1861 at Utica as Private in Co. A, 14th NYSV, age 19; transferred to Co. F, 26th NYSV July, 1861; Adjutant Aug., 1861; WIA Aug. 31, 1862 at Bull Run; MWIA Dec. 13, 1862 at Fredericksburg, died Dec. 15, 1862. From the May 31, 1902 edition of the Utica Saturday Globe, "The most youthful of the trio was Adjt. William K. Bacon, the only son of Judge William J. Bacon, of fragrant memory. He was born in Utica February 15, 1842, and was educated in the common schools and the Free Academy., going thence to a preparatory school conducted by Rev. Jonathon Edwards Woodbridge at Auburndale, Mass. He was studying at Hamilton when Sumter's guns aroused the country and he promptly enlisted in Co. A, of the Fourteenth Regiment, and went to the front. Later he became a member of the Twenty-sixth Regiment subsequently became its adjutant. He was wounded at Manassas, but recovered in time to rejoin his regiment in October. December 13, 1862, at the battle of Fredericksburg he fell mortally wounded, shot through the left leg. Amputation was necessary and he died December 16. The post which bears his name is the largest of the local organizations." MYSTERY SOLVED - Fraternity, Charity, Loyalty (F.C.L. ), motto of the Grand Army of the Republic. Fraternity referred to the brotherhood and sisterhood of those who had served together, Charity referred to the work the organization did to ensure the well-being of widows and orphans of veterans as well as the pensions obtained for them, Loyalty referred to loyalty to the Constitution and flag of our country. You'll find many old iron GAR furnished flagholders in cemeteries in Bradford County. Many have the Camp No. on them (see my illustrated article on the GAR published on Joyce's site for an example). as well as the acronym F.C.L. http://www.rootsweb.com/~srgp/flaghold/flaghold.htm. The motto is used today by the Sons of Union Veterans of the Civil War, the successor organization of the GAR. 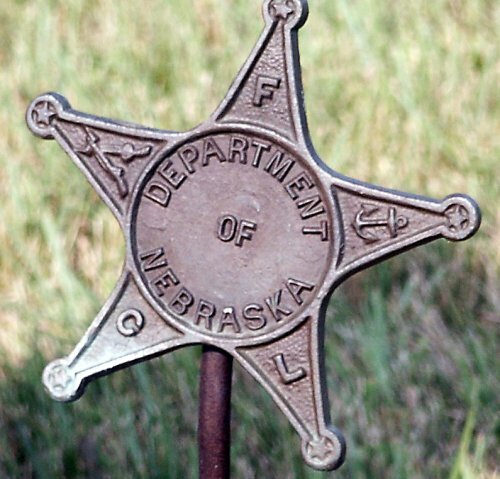 Nebraska is a mid-west plains state. Historically, it was the first state to join the Union after the Civil War, becoming the 37th star in the flag in 1867. Settlement greatly increased in the early 1870s. Many Civil War veterans came, took up homesteads and helped establish towns. Thus the state has quite a few memorials to the Civil War soldier. Daughters of Union Veterans of the Civil War 1861-1865 (DUV) was originally Daughters of Veterans (DV). It was organized and incorporated in 1885, and is believed to be one of the earliest of women's patriotic direct-lineage societies.